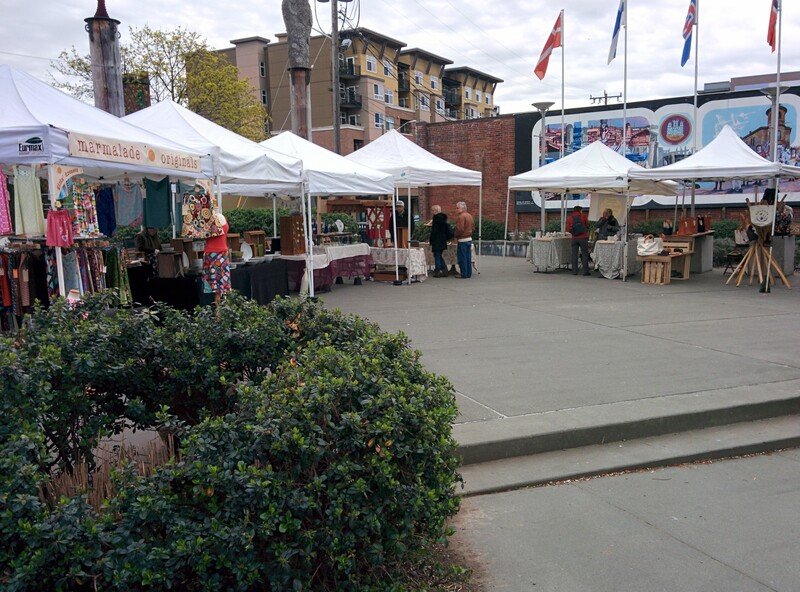 Ballard Farmers Market grows into Bergen Place Park. 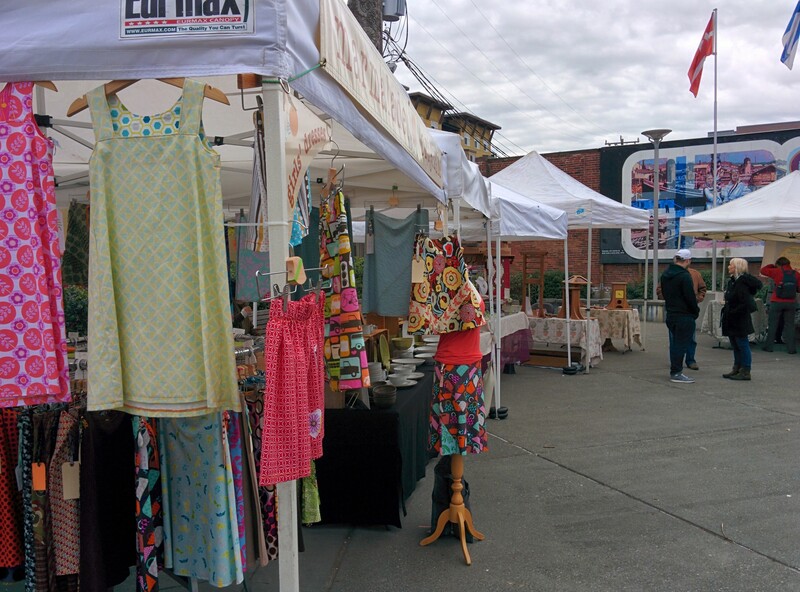 We are glad to have a little more space to keep more of our fine foods and craft vendors longer through the summer as the farms begin to rush into the Ballard Farmers Market with their larger harvests. You may have noticed over the years, the market experiences a gradual loss of some of our favorite food makers and handmade crafts as we have more and bigger farm presence. A shout-out goes to the City Department of Parks and Recreation for approving our use permit of Bergen Place. Now we can keep more of our fine vendors working in Ballard. You’ll see a rotating variety of vendors over the coming months, like: Veraci Pizza! Their famous pizza oven cooking pizzas with many locally sourced toppings, was scheduled to move into Bergen Place at Ballard Farmers Market this Sunday, but they brought the wrong size truck and can’t make it work. I apologize to those readers who saw this False alarm last night and the earlier post this morning. We will try to work it out for next week. Loading pizza into the mobile oven at Veraci Pizza at Ballard Farmers Market. Copyright Zachary D. Lyons. Once upon a time, in the far distant past, mothers and crones and medicine women were the keepers of the villagers’ health. It was from them that the secret of the Spring Tonic was imposed into the family diets and for treating illnesses in the community. The medicine women had learned, what much later would be named by modern science as Micro-Nutrients and Vitamin C, were effective at helping people fight off the ravages of the winter weather and effects of less food for the people during the dark months. They knew the secrets of recovery that were held within the bright green shoots emerging in the forests around them. Miners Lettuce, saved many miners’ lives during the mid-1800s. Many men were taken in by the myths of “gold in them thar hills” that came out of the California Gold Rush. These guys were gullible. They thought that within a few weeks, they could just walk around the mountains, picking up huge gold nuggets, and return home with their fortunes before their families missed them. Consequently, many opted not to bring food supplies with them and, of course, many soon began to starve. Luckily, the mountain ranges of the West Coast had a native plant, Claytonia profoliata, growing everywhere in the forests. This beautiful and delicious green was packed with vitamins, most especially “C”, and its common name, of Miners Lettuce is a testament to how many miners’ lives it was responsible for saving and how many of those silly men made it back from the wilds of the Northern California Sierras alive, if poorer. Excellent in salads, as a beautiful garnish on any food, and used on sandwiches in place of lettuce. The flavor is almost tart, but mild, and children love eating it fresh picked. Both Nettles and Chickweed, endemic to fields and forest, paths and hedgerows, have also provided natural remedies for eons. One is scary and the other is stepped on wherever you go. Chickweed, or Satin Flower as it was called in the early days of civilization. From Stoney Plains Organic Farm. Copyright Zachary D. Lyons. Chickweed is delicate and if soaked in cold water for an hour or four, will leach many of their healthful nutrients into the water and provide a refreshing drink to those who may have to re-hydrate from congestion or a cough from a cold. Then use the greens in a fresh salad, on sandwiches, or as a garnish, much like you would parsley or cilantro sprigs. Wild stinging nettles from Foraged & Found Edibles. Photo copyright 2010 by Zachary D. Lyons. The Nettles, with their prickly leaves, should be placed in a bowl of water, rinsed and drained. Best if you use a pair of tongs or a spoon so as not to touch them with your hands. Then throw them into a saute pan with mushrooms, onions and/or garlic, and eaten like any great vegetable. Their sting disappears with the cooking, and may be responsible for a big part of the nutrition they provide. Oxbow Alice. Photo copyright by Zachary D. Lyons. Our amazing weather has caused bumper crops that are popping out of the fields of our area farms like magic. One Leaf Farm is one of those. I got a call from Alice, formerly the beauty who was always seen behind the tables of Oxbow Farm in the past years. Now she works with Rand Rasheed. Rand Rasheed, Owner & Operator of One Leaf Farm from Snohomish. Copyright Zachary D. Lyons. It seems these two powerhouse women farmers had more greens than the restaurants they normally supply could use this week. So when they asked if they could bring One Leaf Farm greens this week, I jumped at the chance to bring them to Ballard Farmers Market. Fresh eggs from Growing Things Farm at Ballard Farmers Market. Copyright Zachary D. Lyons. Award winning wines from Lopez Island Vineyards. Photo copyright by Zachary D. Lyons. A consistent winner of prizes for Best-of-Category, Lopez Island Vineyards will be taking a hiatus from the Ballard Farmers Market in order to catch up with the many Spring chores that a vineyard has. Again, because of this amazing weather, the vines are requiring a lot of attention. As so many of our farms, Brent Charnley and Maggie Nilan, are working the vineyards and running the winery almost entirely by themselves. You’re encouraged to come to market this Sunday, stock up on their very special wines and say goodbye. If you have the time, volunteer to help out at LIV, and you could find yourself with an interesting job while you enjoy one of the most beautiful islands in the world. Be sure to pick up enough bottles to last until they return. Luckily wine keeps in a cool pantry or basement excellently, actually getting better. It’s a feeling of security to have a stock of great wines, ready for that special occasion when only the best local taste will meet the standard of what you want to sip. Try taking home their most recent winner, Malbec, their lovely Gold Winning Madeline Angevine, it won a Platinum Award, and the Siegerrebe white wine, declared “top-quality” by Wine Press Northwest. NEED SOMETHING NEW FOR THE SPRING? Find a one of a kind skirt to brighten up these warmer days. Children’s sizes are also available. Jerry Baxter, the man behind Got Soup? Copyright by Zachary D. Lyons. Soup is nutritious, delicious, and makes everyone feel better, no matter what the day is like. We are proud to have Jerry Baxter bringing his handmade soups, always made from local and organic ingredients, every week. Got Soup? has what you need for this Spring weather. This week’s selections are Thai Peanut and Chicken, and four Vegan Soup Choices: Hot & Sour Mushroom, Green Risotto, Vegetable Chili Verde, and Coconut Red Lentil Dal, and Broccoli & 3 Cheeses. A hint from our busy market master is to “Be sure you have one or more of these soups in your freezer for those times when everyone comes home hungry, tired and needing to eat right away.” These are real meals, made from local farm produce that are ready in no time at all. And while the soup is heating, you can add a hearty side dish, such as Cornbread with Caramelized Apples and Onions with Thyme. Find it on our website at sfmamarkets.com in the Recipes section. This is an easy, elegant and yet quick answer to those moments you need a dinner fast. They are also excellent for those times, like the Ides of March, when only comfort food will do. Washington-grown saffron from Phocas Farm in Port Angeles. Copyright by Zachary D. Lyons. Under the heading of, “We continue to bring everything of the highest quality that you could possibly need for your kitchen table from local producers” category, how about local Saffron? This herb adds a perfect and sumptuous flavor to feed your soul and body. Ballard Farmers Market is proud to be the exclusive outlet for Jim Robinson, who grows this delicate herb at his farm in the foothills of the Olympic Mountains in Port Angeles, Phocas Farm. This is superb saffron that has become a favorite with many of the best chefs in Seattle. Why buy Iranian-grown saffron marketed as “Spanish” in the Big Box stores, when you can get better saffron locally? Use it to flavor your chicken & rice soup and experience greatness. Are you feeling a bit windblown and dreary these recent damp Spring mornings? Maybe a little grey, or mossy, or perhaps even chilled? Ballard Farmers Market has the cure for that. Chicken broth made lovingly out of these products from our impeccable farms. Place the washed bird into a deep pot, add water, a chopped onion, garlic, a dash of salt, and dry herbs you love. Bring to a gentle simmer for 45 minutes to an hour, or until it begins to fill your home with comforting aromas. Turn off the heat, let sit until you can place the pan into your fridge. Let it get cold. Remove the meat from the bones and put back into your broth. Add any great veggies you love, roots first, and simmer again. Coarsely chop greens and add to the pot about 10 minutes or less before you want to eat. Serve with a garnish of your choice. Try finely sliced Swiss Chard or spinach from Colinwood Farm, shredded cabbage, collards, or kale from Nash’s, Growing Washington, Stoney Plains Farm, or Kirsop Farm, and garnish with mint or cilantro from Children’s Garden. You get the idea, Ballard is seeing more of these leafy gems appearing every day. If you need some chicken broth immediately, stop at the Stokesberry Sustainable Farm to pick up a nice cup of the warm and soothing broth that they make at the farm. You’ll be glad you did. Check out all of the fine choices available from the local farms at Ballard Farmers Market. Growing Things Farm at Ballard Farmers Market. Copyright Zachary D. Lyons. Skagit River Ranch. Copyright by Zachary D. Lyons. Fuji apples from Tiny’s Organic Produce. Copyright by Zachary D. Lyons. Yes, these beautiful Fuji apples, and a great variety of other wonderful fruit, including dried fruit, can be found at Tiny’s Organic Produce. These are perfect for an energy boost or as an added ingredient in cornbread. Check out our recipe pages at sfmamarkets.com Just in case you want to mix it up a little, you can also find a very easy and delicious recipe for Potato and Leek Soup while you explore the recipes. Your Ballard Farmers Market is chock full of all sorts of goodness for your home, from all the freshest fruits and veggies, meats, seafood, poultry, cheese, to baked goods, sauces, confections, fresh-cut flowers and fresh milled flours, plants for the garden, wild mushrooms, and on and on. Autumn Martin with her Hot Cakes at Ballard Farmers Market back in 2009. Copyright Zachary D. Lyons. In the People’s Republic of Ballard, and especially at your Ballard Farmers Market, we know great, local food and drink. So it is no wonder your Ballard Farmers Market has been home to, and indeed a launching pad for, many now very familiar and celebrated names in the local food and beverage industry. And as I continue my personal countdown to retirement from this blog, today I celebrate just a fraction of the extraordinary folks with whom we have shared the street over the years, and the success they have so deservedly achieved. Like Chef Autumn Martin of Hot Cakes, now with her own storefront just a block up from the Market. Most days, there is a line out the door there to eat her delicious chocolatey creations, but did you know Hot Cakes got its start right here on the street at your Ballard Farmers Market? Yep. We couldn’t be more proud of you, Autumn. And just look at all of the press, from all over the world, she’s getting! Veraci Pizza co-owner Marshall Jett being interviewed by Food Network Canada. Photo copyright 2010 by Zachary D. Lyons. This photo is from 2010, when a camera crew from Food Network Canada arrived at your Ballard Farmers Market to feature Veraci Pizza on their street food show, Eat Street. You probably see Veraci’s mobile pizza ovens all of town — heck, all over the Northwest. Besides their storefront on Market Street, they have a depot on 15th Avenue on Crown Hill will dozens of the trailers. You will also find them in Spokane, in Oregon and in Idaho. But did you know that they got their humble beginnings right here with us many years ago? Back then, they just had one, and then two trailers. Wow. We just love a great success story! Kimchi, Krauts & more from Firefly Kitchens at Ballard Farmers Market. Copyright Zachary D. Lyons. Firefly Kitchens got its start in a shared kitchen space in Frelard in 2010, introducing Seattle to what has now become one of the biggest trends in food: fermentation. They gathered up local veggies from area farmers and allowed them to naturally ferment with delicious and nutritious results. We liked them so much, we directed them to the Good Food Awards in San Francisco in January 2011, and low and behold they won! And they’ve been winning ever since! And while you can now find their products at finer grocery stores throughout the area, the finest grocery store for them is still right here at your Ballard Farmers Market! Farhad from Tall Grass Bakery at Ballard Farmers Market. Copyright Zachary D. Lyons. Yes, we all still miss us some Farhad, who retired from Tall Grass Bakery last September. So I thought I’d pay homage to him one more time whilst also reminding all y’all that Tall Grass Bakery also got its start with us, way back when your Ballard Farmers Market was wedged into the Fremont Sunday Market at 34th & Fremont, before Fremont was redeveloped and the Market moved to Ballard in 2000. They, too, shared a kitchen with another bakery back in the late 1990s. Now, they make some of the best bread in Seattle out of their storefront on 24th Avenue NW and bring it to you here at your Ballard Farmers Market, as well as other markets and restaurants all over King County. Market Master Judy Kirkhuff with Nash & Patty Huber of Nash’s Organic Produce at Ballard Farmers Market. Copyright Zachary D. Lyons. In 2008, American Farmland Trust gave Nash Huber of Nash’s Organic Produce in Dungeness their annual, national Steward Of The Land Award. It is just one of many awards Nash has won over the years for the hundreds of acres and many farms he has not only kept in farm production in Clallam County, but that he has rejuvenated, rebuilding the soils, working with the local climate, and developing his own varieties of seeds that would thrive there. The result is a farm that is at its peak of production all winter long while many other local farmers are home reading seed catalogs or vacationing in Mexico. And like Bob Meyer, whom I saluted yesterday, Nash, too, has pioneered organic agriculture in Washington and helped many an up-and-coming farmer along the way! Don Hilario Alvarez holding hot chile peppers at Alvarez Organic Farms. Copyright Zachary D. Lyons. Today, it is hard to imagine a farmers market around Seattle in August and September without the dozens of varieties of organic peppers from Mabton’s Alvarez Organic Farms (currently prepping their soil for the 2015 growing season!). Don Hilario Alvarez, the farm’s patriarch, is a classic American success story — a true example of an immigrant who pulled himself up by his own bootstraps, scrimping, saving and investing, until he became one of the most admired organic farmers in the nation. Way back in 2004, ATTRAnews, the newsletter of the National Sustainable Agriculture Information Service, celebrated him in a feature story in their issue about Latino farmers. Roger Wechsler of Samish Bay Cheese. Photo copyright 2009 by Zachary D. Lyons. Back in 2010, Seattle was host to the American Cheese Society Awards, and frankly, our Market vendors mopped up the floor with its competition. And the winningest of all of your Ballard Farmers Market’s cheese makers was Samish Bay Cheese, taking home four separate awards. Stop by and take a tasting tour on any Sunday right here, and you will understand why! Janelle & Jerry Stokesberry of Stokesberry Sustainable Farm support I-522. Photo copyright 2013 by Zachary D. Lyons. Ever wonder what makes the Seahawks and the Sounders play so well? We like to believe it is because they eat eggs and chickens from Stokesberry Sustainable Farm. Need I say more? Tacos from Los Chilangos. Photo copyright 2013 by Zachary D. Lyons. Oscar Mendez comes from a family of great Mexican cooks, and our markets are proud to have fostered them. Now, Oscar’s Los Chilangos lays claim to being the only mobile taco stand sourcing its animal protein locally. He get it directly from local, sustainable and humane farmers, fishers and ranchers right here at your Ballard Farmers Market. He gets rockfish from Wilson Fish, beef and pork from Olsen Farms, and eggs from Stokesberry Sustainable Farm. Best of all, his food is wonderful! And I round out this tribute to the achievements of the many vendors we quite frankly consider our family… heck, our children… with neither the last nor the least of our award-winning, storefront opening, international media starring market heroes. This is Brent Charnley from LIV (a.k.a., Lopez Island Vineyards). One of our state’s oldest wineries, the fact that it is certified organic makes it even more unique. Rarer still, it is located in the Puget Sound Appellation, Washington’s coolest, dampest wine-grape growing region, producing many Germanic varieties of grapes, and a few French, that just simply won’t grow elsewhere in Washington. And the list of awards their wines have won over the years is, frankly, almost embarrassing. Stop by for a taste to find out for yourself, and then take a great bottle, or three, home this Sunday! Midweek Update for Thursday, January 22nd: Seahawks Chow! Jerry Stokesberry of Stokesberry Sustainable Farm holding one of his delicious chickens at Ballard Farmers Market. Copyright Zachary D. Lyons. Did you know that the Seahawks (and the Sounders, actually) get chickens and chicken carcasses from our very own Stokesberry Sustainable Farm? Yup. They use them for stock and such. See, it is just one more way that our two very successful football teams take advantage of every opportunity to help their players be the best that they can be… in this case by feeding them high-quality, humanely-raised, delicious and nutritious certified organic chickens from a great local farm. If that weren’t enough, legend has it that Russell Wilson will only eat duck eggs from Stokesberry Sustainable Farm. He has been said to watch the team chef take those eggs out of the Stokesberry carton and crack them into the pan, just to make sure that’s what he’s getting. Lesson, if you want to be the best, you have to put the best in your body!